If you are looking for information on the Java Jo'z franchise business opportunity, Java Jo'z coffee franchises or Java Jo'z franchising, then you have come to the right place. I Love Java Joz & It Loves Me! AND INFORMATIVE BUSINESS DISCOVERY DAY! Spend a day with us on the beautiful Emerald Coast of Florida and get to know us like family! GENTLEMAN & LADIES ... START YOUR ENGINES... Java Jo'z is breaking out of the pack and setting new coffee industry records as we equip our family of owners with the most beautiful drive thru buildings, the highest quality products, unparalleled levels of service andbest of all access to the greatest Specialty Coffee's, Chai's, Smoothie's, Handmade Sodas and much, much more! "Turning Heads"... is one of the most important things a drive thru business can do for its owner. And our double-sided drive thrus do just that! Every Java Jo'z drive thru is built and equipped by Emerald Coast Manufacturing (Think Ferrari - Think Emerald Coast) and not only is each building guaranteed to meet or exceed all federal, state and city building and health requirements, every building is also a work of art combined with the highest levels of operational functionality. "I have seen lots of programs come through my office in my years as an SBA loan specialist and have yet to see a better package offered by anyone else." This is no stripped down business model... Every Java Jo'z drive thru business comes fully stocked and we do mean stocked! 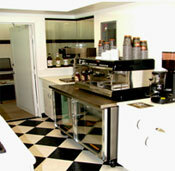 You will have everything you need to take the lead in the specialty coffee business in your town! Yes, you will begin making fantastic products and profits from day one, as you serve the worlds best specialty coffees & more to your drive-up customers, who want their java and non-java drinks served to them in the fast lane ... Like in under a minute! Watch Out Starbuck's... We have the green light and the competition is about to really heat up! Java Jo'z is "Perkin' Up America's Commute" with the best of the best specialty coffee and non-coffee alternative drinks & more. 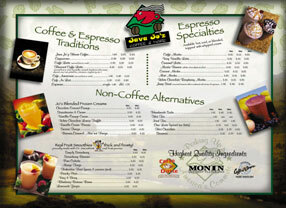 Java Jo'z exciting menu leaves nothing to chance. It has been designed and field tested and carefully chosen to insure that it contains the right products at the right time, so your customers keep coming back and your profits keep skyrocketing. Let Us Show You How You Can Be In The Specialty Coffee Business In As Little As 180 Days And To Get To Know More About Our Products, Buildings, Equipment, Training, Real Estate, Marketing, Advertising, POS Materials, Store Accounting Systems, Cash Controls, Sales Tracking, Menu Mix ,Beverage & Food Cost Tracking, Monthly Ezine & Newsletters, Weekly Owners Phone Conferences, Yearly Owners Convention.